There’s been a slight change of plans. Up until this point, my restoration strategy had comprised three phases: Preparing the garage, restoring the body and interior, and rebuilding the engine. The third phase was necessitated by the fact that in early ’04, I had run the Z’s engine without oil pressure for about three-quarters of a mile. Even after a fresh oil change, the car exhibited somewhat odd behavior after being started, characteristics I had chalked up to my carelessness. All the parts and work necessary to start the engine I’d have to invest anyway. It makes no difference whether the engine is rebuilt or in its current state, fuel lines, spark plugs, gaskets, battery, etc, are going to have to be replaced. I can do the work on the Z while simultaneously prepping the garage. The main goal of garage preparation is storage and organization. Just getting the Z running doesn’t require a long-term home for any of the (few) bits I’d pull off. Those two efforts can move forward in parallel. The behavior the Z displayed after the no-oil-pressure incident wasn’t a sure sign of internal damage. There were no metal shards or flakes in the oil after the incident. When I started the Z’s L24, the engine would cycle between bogging and racing, but… I had had some issues tuning the carbs, and had just replaced the distributor points—two factors that could cause the behavior in question all by themselves. As one Z buff put it, “Let the engine tell you what’s wrong,” rather than jumping to conclusions about what, if anything, is amiss internally. It would save a huge amount of time and money if the engine is at least somewhat okay. The most obvious advantage of the new tactic. What a load off my mind if the body and interior restoration—daunting as it is—is the sole focus of my efforts to bring the car back to 100%. 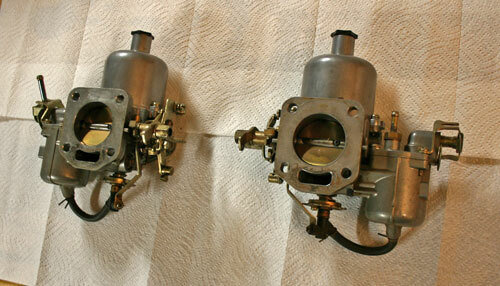 So with that in mind, I pulled the SU carbs (shown at top) off the engine earlier this evening to send them back to ZTherapy for refurbishment. They’d been remanufactured by the Oregon outfit about 15 years ago, but I had been getting a vacuum leak around the throttle shaft—the very issue the ZTherapy process focuses on curing. So we’ll see what they say. After that, it’s just a matter of replacing almost every rubber hose on the car, loads of gaskets, new brake and clutch master cylinders, new plugs, battery, oil, etc… All in a day’s work, right? Congratulations on starting your restoration, Matt. It must be very exciting! Never underestimate the importance of ‘little victories’. They inspire us to take the next few steps and keep the end in sight. Even if things are tough, those little victories give us hope and help us feel that progress is being made. I’m so glad you’re diving right in. Big restoration projects (whether they be cars or houses) are all about carefully managing both your time and money to get the desired result and remain an enjoyable experience. Thanks John. Good luck with the house! Don’t suppose you’ll have project progress posted online anywhere? ?